I have had these lotions for a long while but I've been opting for jojoba oil, almond oil, Vaseline, petroleum jelly, Egyptian Magic, and several other lotions with no fragrance. I keep telling myself that I will use my stash of lotions but I never do. Side note: there is a naked pursuit suspect rescue in the waters at Redondo Beach right now! Haha! It took 3 lifeguards to bring in this naked 300 pound man. So, I think I figured out that the stronger the fragrance the less I'll use it. My nose has always been sensitive but pregnancy has made my nose more sensitive. I don't like strong fragrance as much anymore because it will give me headaches or set off feelings of scent aversion. Secondly, the more fragrance is in the lotion the less I enjoy the end texture of the lotion. I find that those lotions leave some sort of gritty residue in the grooves of my fingerprints. 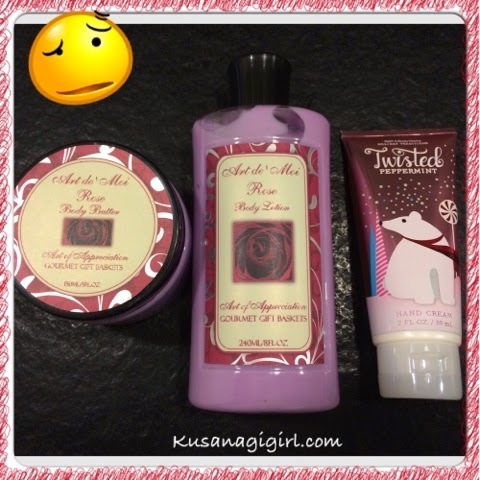 The above are lotions that are still brand new. I received these as gifts but never used them. The lotion on the right was a gift from Linh (Blushology) and smells like peppermint candy. The other 2 on the left are from my best friend in San Francisco. They have seals on them but I can smell the rose scent through them so I'm sure the fragrance is stronger than my nose can handle. I'm going to take these to the office and give them to my colleagues. They seem to like fragrances lotions better. The above are lotions that I have used and have gotten to the half-way point on these but can't seem to finish. I used to enjoy baby scented things like baby lotion and baby powder but I just can't handle the fragrance anymore. During this pregnancy it seems that the perfume is just a little sharper than I like. The middle is a hand lotion that I bought from Sephora. I don't think I ever liked it. It's a perfect example of a lotion that is more of a perfume than a moisturizer. My hands always feel just as dry after using it but the scent lasts forever and gets transferred to whoever I hug or touch. I'm not sure what to do with the baby lotions exactly but I'm taking the Thai Lily hand lotion to the office to leave in the ladies' room. 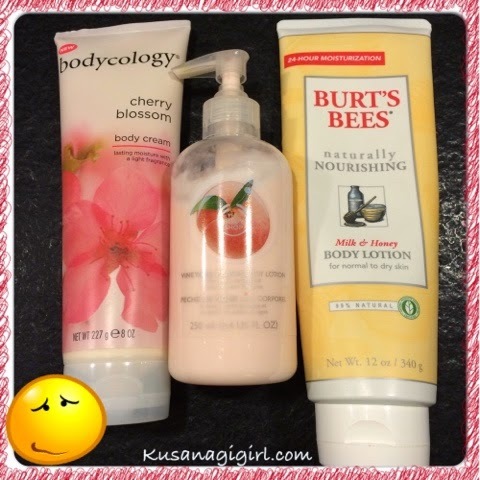 The above are lotions I'm on the fence about. The Bodycology lotion has a very mild scent and actually feels moisturizing without leaving a gritty feeling in the grooves of my finger prints. I think maybe I'll keep it.... Maybe. I'm not sure if I'll keep the Body Shop lotion. I like the scent of peaches and apricots, but this lotion doesn't moisturize very well and leaves behind a gritty feeling. I'm really on the fence about the Burt's Bees lotion. I used to like its scent but can't seem to handle it during this pregnancy. However, it is quite moisturizing and Burt's Bees is a brand that doesn't test on animals... So it's definitely got that going for it. If I purge everything pictured here you can rest assured that I've found new homes for them. I think most of these products are good products, but I think pregnancy may have made my nose too sensitive. I guess it makes it all the easier to smell a poopy diaper. Haha. Jellybean is finally sprouting her canines and molars! She's just started saying "bye" when she waves goodbye and gives us kisses when we ask for kisses. She's also very expressive when she's trying to talk, even though she's still using baby language. I'm in my 3rd trimester and somewhere between 31 and 32 weeks. So only a few more weeks to go before we welcome our newest addition! I've been getting PMS-like cramps along with Braxton-Hicks contractions for a while, but not regularly enough to warrant a visit to labor and delivery. Something different from my last pregnancy is that I've been losing bits of my mucus plug for several weeks already but my doctor doesn't seem too worried. My husband really is the best! I've lately been enjoying McDonald's Oreo McFlurries. My husband will buy two, one for me and one for him, but he'll purposefully eat it slower so that he can give me what's left of his when I'm done with mine. That's love!